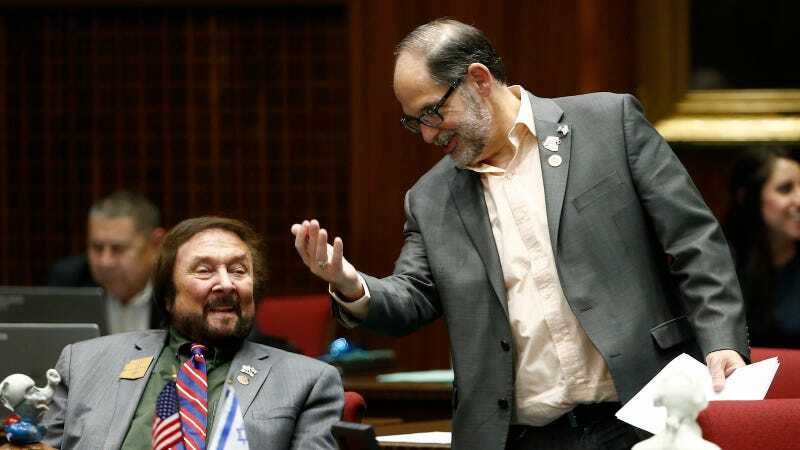 Arizona state Rep. David Livingston, right, R-Peoria, talks with Rep. Jay Lawrence, R-Scottsdale, during floor debate at the capitol Wednesday, May 10, 2017, in Phoenix. (AP Photo/Ross D. Franklin). Image via AP. After a certain point, you almost have to admire how committed Republicans are to defending and enforcing their racism. Arizona state Rep. David Livingston, R-Peoria, has sponsored a bill that he says will encourage insurance companies to translate policies “into multiple languages for the benefit of consumers.” However, in reality, HB 2083 would invalidate any non-English version of an insurance contract, even if the two versions conflict, AZ Central reports. This means that, if this bill becomes law, a non-English speaker signing a life insurance policy in Spanish would be legally obligated to honor only the English version of that contract—even if a mistranslation changed her contract’s meaning. The bill effectively protects insurance companies at the expense of non-native speakers, whose non-English contracts would be meaningless if this bill passes into law. This, right here, is how racism is institutionalized and becomes systematic. Current state law stipulates that non-English versions of insurance contracts must be identical to their English counterparts, including “a sworn statement signed by the translator attesting that the translation is identical in substance to the English document.” So why would this law expand opportunities for insurance companies (or, as Republicans spin it, help consumers)? Nationwide Insurance, which supports the bill and currently only offers insurance policies in English, says HB 2083 will help the insurance company expand its reach. “We are not looking to do anything other than provide an extra customer service to clients and customers who potentially don’t speak English or may not be comfortable with English,” Nationwide Insurance lobbyist Daniel Romm told the panel.